At the beginning of film production stars and their directors were the really creative artists in film. Most of them came from backgrounds rich in theatrical experience. They were Hollywood's most treasured assets beyond the reach of technicians. Support staff, producers, writers, engineers, cutting editors, art and music directors, plus composers, set crews and most particularly, publicists, all worked within the studio system to create that special glamour and magic of movie making. Metro-Goldwyn-Mayer was the leader of prestige films. The quality and production values in the MGM product were unsurpassed in the mid-twenties. The collaboration of Marcus Lowe and Nicholas Schenck proved to be a dynamic partnership. Together with Samuel Goldwyn, they formed the company in 1925. 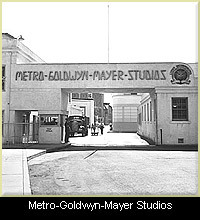 They hired Louis B. Mayer to head the studio for his many talents, not the least of which was his belief in the twin values of opportunism and high moral values.. After some time, Goldwyn broke from the group and began producing his own films. Lowe owned the theaters and ran the distribution end and Schenck, headquartered in New York, watched the bottom line. The studio trademark was the roaring lion but it was Louis B. Mayer who was the real "lion" at the studio. He was a great showman; flamboyant and tight-fisted. He demanded complete loyalty from his stars and, legend has it, gave as much to them. He regarded all those who worked for him as his extended family. 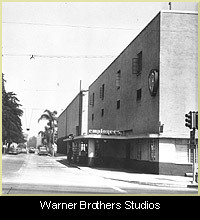 Warner Brothers Studio was founded in the early years by four brothers, all producers. It began as a very small operation. It expanded exponentially after buying the Vitagraph sound process. Warner Brothers studio's venture into film/sound production, The Jazz Singer, the company's colossal hit, put it in league with the Lowe's (MGM), Zukor's (Paramount) and First National, the independent theater and production company. Within three years of purchase the company was as strong as its rivals. 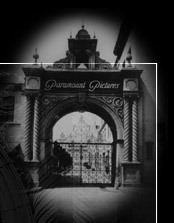 Paramount, founded by Adolph Zukor, was inspired to take a chance on a lengthy product. One or two-reelers were the order of the day, which he made. However, he was aware of the favorable reaction by the public to the great dramatic stage actress Sarah Bernhardt's, Queen Elizabeth. Though a silent, it was a movie that ran for six reels, a phenomenal time in those years. This experience with Bernhardt inspired Zukor to form the first American Art Film Company. He called it Famous Players in Famous Plays. 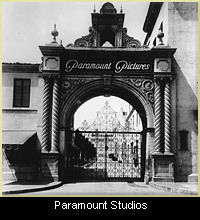 The company evolved into Paramount Pictures. William Fox, originally a film distributor and theater owner, also became a producer. As the trust companies broke up and distributors became producers, some companies merged. Fox partnered with Twentieth Century and became Twentieth Century-Fox. Conversion to sound completed the five major Hollywood studios. 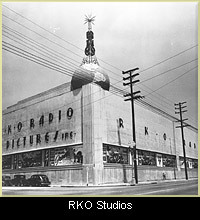 The fifth studio was established by Radio Corporation of America to promote its sound system, Photophone, in theaters. Its partners included Film Banking Company, a small production unit, and the Keith Orpheum Circuit, vaudeville producers, in order to acquire their theaters and control film distribution for products of American Pathe Studios. This amalgam gave birth to R.K.O. Studio. Three lesser studios of the period worth mentioning are Universal, founded by Carl Laemmle. He was originally a film exchange man who turned producer and formed his own company in the early years. Columbia was founded solely by Harry Cohn, He early recognized Frank Capra's talent and chose him to direct many of Columbia's early films. As Capra succeeded, so did Columbia. That talented combination reached a peak in It Happened One Night and the film won Academy Award recognition for him and Capra in 1934. United Artists was primarily a releasing organization. The founders, Mary Pickford, Charlie Chaplin, D.W. Griffith and Douglas Fairbanks started the company in 1919. Each player produced his own films to be distributed by U.A., an east coast company. During the thirties, the company was the primary distributor for Samuel L. Goldwyn, David O. Selznick and other independents.